Pima Air & Space Museum is one of the largest air and space museums in the world, and the largest non-government funded aviation museum. It is located in Tucson, AZ. Ultimately, Pima is one giant hands-on math and science lesson. 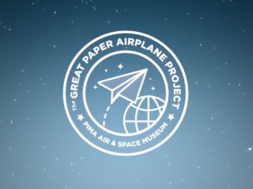 So BeCore set out to create a new generation of aviation fans by giving them the chance to design, build and fly the world’s largest paper airplane. This idea was crazy. It’s never been done. And to pull something like this off on a museum’s pro-bono budget based on donations, they needed to be crafty. Everyone they approached about the project wanted to help because it brought out the kid in them! It took on its own life, and after months of planning, building, and testing, they took the giant plane into the air, filmed it, and… it flew. If you have questions about custom fabrication or experiential marketing contact BeCore today! They’d love to partner with you!